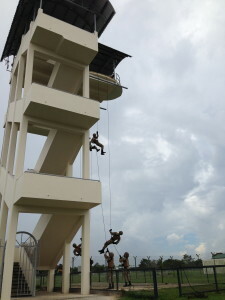 A Company conducts Helicopter Abseiling Training. Report by Corporal Anil Rai, A Company, 2 RGR. Being the Aviation company, we A (Amboor) COY, 2RGR, took part in Helicopter Abseiling Training at Training Team Brunei (TTB) and the Garrison Sport Complex. The training session ran for four days (29 Apr-3 Mar 2013). Training was led by Sgt Nawaraj Jimee, who was the Chief Instructor for the event, and supported by other Guru-jis. All the available members from the Coy took part in the event. The aim of the training was to practice and test the confidence of soldiers to abseil from the Bell 212 helicopter with and without their full equipment, in order to prepare and enhance the Coy’s Air Assault capabilities and meet the requirement of operations in jungle warfare. On the first day of the course, we attended the abseiling class, which included the safety brief, fit and test of kits, duty of the break-man and serviceability of kits. After the class we went for a practical demonstration of how to abseil (without equipment). We watched the demo very carefully because abseiling can be dangerous – a single, minor mistake can cause serious injuries. Immediately after the demo we queued for abseiling. At our first jump, some of our comrades were less than confident and their legs were shivering. However, by the second time this had passed and they were confident with the height. In the mean time we took turns to practice the break-man job. By the end of the day we had learnt the techniques and mechanism of how to abseil and do the job of break-man. On the second day of the training, we had to jump with weight (bergen and webbing with SOP kits) including weapon (SA80 rifle). The technique was similar to the previous day with some minor adjustments. We were shown how to fit weight and weapon on the body, what to do and not to do while jumping and safety measures to apply. On our first practice it seemed to be a little uncomfortable and dangerous but when we jumped, it was smoother than jumping without weight. All our training until then took place in TTB camp, where there was a dummy helicopter built on a 100ft gantry. That was just for the introductory phase. On the third day, we were going to bring all our practice together and jump from the Bell 212 helicopter for real. It was very different and felt more difficult than the jumps we did from the dummy helicopter. The Bell 212 was much higher than we expected. Although everybody seemed to be confident and happy to jump, I do not know about others’, but my heart was pumping a little bit faster. However, I controlled myself and did well. The rest of the company followed and all did well with no injuries or accidents. On the final day, there was some time for extra practice as all the technique had been learnt and we made sure that all the company had done at least one jump from the Bell 212. In conclusion, this training was a great experience for all of us. It was a mix of danger, fun and education. No one got any injuries, everyone was fine. By the end of the training we were happy and proud. I am very thankful to those members who were directly and indirectly involved in the training session.